Chapter 1: What Is the Investing Strategy That Beats the Pros? As a 30 year investing veteran, portfolio manager and university investments instructor who reached her retirement goals a while ago, I want to share what I’ve learned about investing with you. You’ll also discover what Nobel Prize winners, academicians, and many financial experts have proven works in growing your money by investing. The first day in my Investments class in the Penn State MBA program, the professor said, “Raise your hand if you think you can outperform the markets.” My hand shot up. After all, I was a portfolio manager with a solid investing record. I was fully confident that I could outperform the markets. Throughout the class, I delved into the research and totally revamped my investing approach based upon the data. That’s right, there is evidence which defines the most successful investing approaches. Turns out, diversification based upon asset classes in line with your risk tolerance leads to returns which outperform professional investors 60 to 70 percent of the time. Don’t just take my opinion; in addition to Nobel Prize winner Daniel Kahneman, there are scores of well-known economists and investors who support this investing approach. A few of the proponents of index fund investing based upon asset classes include John Bogle, the founder of Vanguard Funds, Warren Buffett, Rick Ferri, author and Forbes columnist, Nouriel Rubini, the economist who predicted the 2008 housing collapse and subsequent recession, Dr. William Bernstein, widely acclaimed investment researcher and author, David Swenson, Chief Investment Officer of Yale University’s Endowment Fund, and countless others. The research on asset classes is clear, 60 to 70 percent of active mutual fund managers fail to beat the indexes each year. Check out Invest and Beat the Pros-Create and Manage a Successful Investment Portfolio for an easy to implement investing blueprint. Why Not Invest With the 30-40 Percent of Active Managers Who Beat the Index Funds Each Year? What about the 30 to 40 percent of professional managers who beat the indexes? Why not invest with those outperforming managers or pick stocks and beat them yourself? Here’s the problem. Even if a professional outshines the index one year, and let’s say the manager is really skilled and outperforms the next year as well, over the long term it is almost impossible for anyone to consistently beat the indexes. Mark Hulbert, in the May 10, 2013 Wall Street Journal article “Man vs. Machine: The Great Stock Showdown”, asks us to “Consider the 51 advisers out of more than 200 on the Hulbert Financial Digest’s list who beat the market in the decade-long period that ended April 30, 2012 (as measured by the Wilshire 5000 Total Market index, including reinvested dividends). “Of that group, just 11—or 22 percent—have outperformed the overall market since then. That’s no better than the percentage that applies to all advisers, regardless of past performance. Over the past year, on average, the group has lagged the Wilshire index by 6.2 percentage points. What about George Soros or Warren Buffett? Okay, maybe there are one or two investors in the world who outperform the indexes over the long term. Ask yourself this, “Are they really that skilled or just unbelievably lucky?” And what are your odds at beating the indexes? 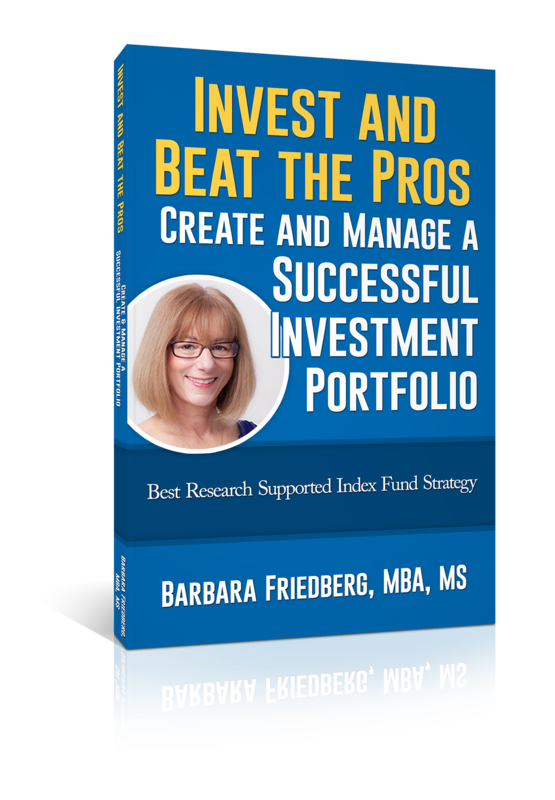 Check out Invest and Beat the Pros-Create and Manage a Successful Investment Portfolio for an understanding of what it takes to manage a successful investment portfolio. In a few short hours of reading, you’ll get the entire step by step guide to put into place your own investment portfolio.